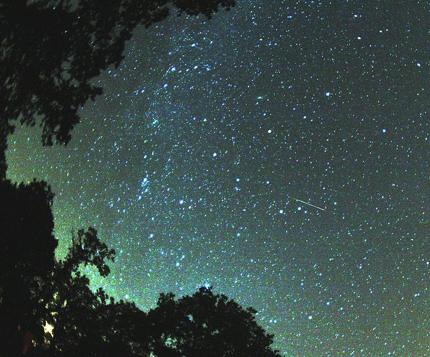 The 2010 Perseid meteor shower peaks tonight. 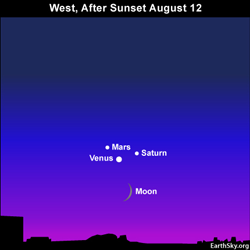 Look late tonight and between midnight and dawn on Friday, August 13. As always, this forecast represents a best guess, not a certainty. Any clear night on the nights of August 11, 12 and 13 should be fine for watching the Perseid meteor shower! Be sure to go to a dark location and watch for an hour or more. The annual Perseid meteor shower ranks as one of the most prolific and dependable showers of the year. With no moon to obscure the 2010 Perseid display, this is a grand year for watching these fast-flying and often bright meteors. The brighter Perseids frequently leave persistent trains – glowing gas trails that last for a second or two after the meteor has gone. What’s more, if you are camping in a dark location – or even if you are in the city – you can glimpse a beautiful moon and Venus low in the western sky tonight shortly after sunset. Mars and Saturn will be nearby, too, but they will be much harder to see than Venus, which is the brightest object in the sky besides the sun and moon. The moon and Venus are visible for only a short time after sunset. Still, the real action tonight requires that you stay up late or get up early tomorrow before dawn. As a general rule, the meteors that shoot off at early to mid-evening are rather few and far between. The meteor rates tend to intensify at late night and after midnight, with the greatest number of Perseids normally falling in the dark hours before dawn. 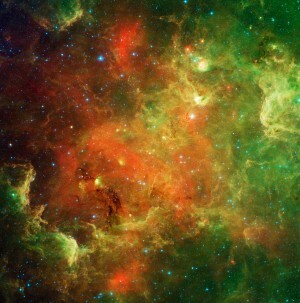 Commonly, you can see 50 meteors per hour – or about one per minute. You do not need any special equipment to watch the Perseid meteor shower. Find a safe spot away from artificial lights. Be sure to have an open view of the sky, because the Perseid meteors streak all across the heavens, and pass in front of numerous constellations. From the comfort of a reclining lawn chair, your unspoiled view of the 2010 Perseid meteor shower – and the star-studded firmament – may count as an experience of a lifetime.